The holy month of Ramazan ends today with the celebrations of Eid. Memsaab wishes you all a very Happy Eid. 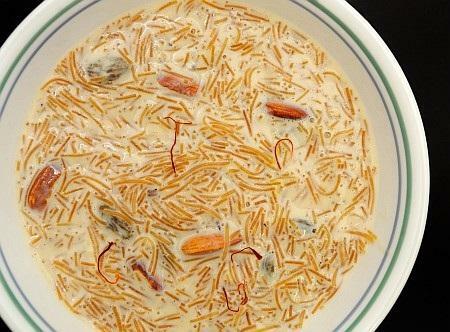 Celebrate this great festival the traditional way with sweet Sevvaiyan. Dry roast the vermicelli before you start the sevviyan dish. Some people prefer to roast it in ghee. Make your choice. -Bring the milk to a boil. -Slowly add the roasted vermicelli and continue to stir. -Add the saffron strands and stir. -Add the crushed cardamoms and the dry fruit, keeping a little aside. -Cook while stirring continously for 40-50 minutes. -Take off the flame and garnish with the remaining nuts and raisins. Let us all celebrate this joyous ocassion with sweets, love and warmth. Eid Mubarak!